Nepal is home for a large mountain range known as the “Himalaya”. Every year hundreds of thousands of tourists decide to spend their holidays in this lovely country, and there is a good reason for that. Delicious food and rich culture are the perfect companions to the majestic landscape that the country provides. The mountain range holds a number of breathtaking treks, which are in pristine rural places where the air is virgin and time stands still. Among all treks Nepal has to offer, the EBC trek is the most famous. The trek provides a rare opportunity to walk in the footprints of early explorers and to reach the foot of Mount Everest without any mountaineering skills. After a few treks in Europe and the Middle East I was more than excited to experience the mighty Himalaya and to take my trekking skills to the next notch. Although no common, I decided to sleep out in my tent as long as possible and cook my own food for a few days. Just trying to follow my trekking philosophy as long as possible. The trek usually takes 11 days and commonly starts with a flight from Katmandu to Lukla (30 min). If you desire to hire a porter who carries your backpack and a guide to show you the way, you can book them from a tourist agency in Katmandu or find them in Lukla. When I was doing the Trek, I was caring my own backpack and because I was in the high session, I just follow the mass off people who were walking up the trail. Every village has a few guest houses, which you can buy cook food and get a bed for the night. Some places are booked in advance so you might need to go to the next village to find accommodation. With food and water, my backpack weighted 30 kg. The flight to Lukla in the tiny plane was a weird experience, it felt more like a small flying bus than a proper plane. From the airplane’s window, I got my first glimpse of the snowy Himalayan mountains, a long range of snowy tips and rough rocks which will be my home for the next 11 days. Underneath the flight’s route, I could see small villages living close to a river. These remote villages spark my imagination and curiosity and I couldn’t wait to arrive in such unique places. Departed at 10:30 a.m., and arrived 30 minutes later. On arrival, I could immediately feel the different atmosphere. Lukla is the entrance and exit point of the EBC. Yaks were loaded with goods for transport to remote villages and trekking shops provided last chance of buying any forgotten equipment. I didn’t want to waste any time so I bought half a liter of kerosene for cooking and immediately started walking on the path to the next village. My body which was not used to physical stress at that time, felt comfortable on the flat ground and on downhill but uphill was torture. The high attitude and lack of exercise prior to the trek made me terribly slow. It was getting dark and I was not close enough to my next destination – Namche Bazar, so I pitched my tent in the garden of some old guy’s house for 100Rp. It was so strange. When I wanted to fill my bottles with water, he sent me to the neighbors and when I asked where is the toilet he pointed to a locked shed and said he broke the key in the lock. I thought it was weird and couldn’t understand, so I asked, “so where do you go to the toilet? Don’t you have one in your house?” His answer shocked me, as I understood how naive I was. “Only rich people have toilets in their houses, I’m poor”. As uncomfortable the situation was I still didn’t understand where should I go to the toilet. He then took me to the edge of the trail where there was a vertical cliff of about 3 or 4 meters high on a riverbank, looking down at the river he said that this is where he goes. “Down there?” I asked. It was hard to believe that an old man like him would climb down this crumbly cliff every time he needs to go to the toilet. 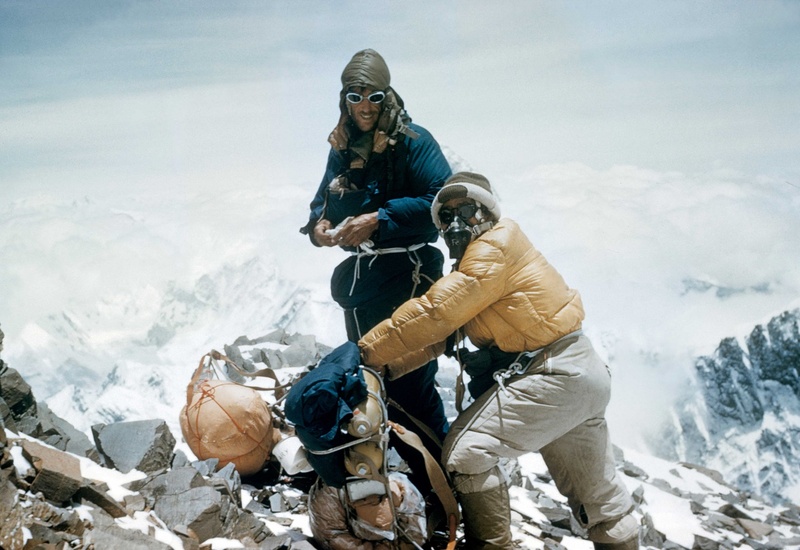 “This is nothing!” he said, “I climbed Mount Everest”. He probably did. I nodded my head and went back to the tent to cook dinner and reflect on my thoughts. The next day I walked to Namche Bazar, at 3,440 m, this is the most expensive place in Nepal due it its remoteness, and it’s the first place on the trek that you get to see Everest’s summit. Because in these high altitudes there is a risk of getting altitude sickness it is recommended to have a rest day in Namche Bazar for letting your body adjust to the low levels of oxygen in the air. I remember how I had to stop and have a short brake every few minutes due to the sharp pain in my legs, the backpack was getting heavier with every step and the trail got steeper. On arrival I continue climbing the horrible steps through the village to camp at the highest spot, this saves me of doing it in the morning of the day I continue walking. I camped in the yard of a guesthouse just at the end of the village. I saw some other tens and I was surprised that other backpackers are sleeping here like me, but quickly I realized that the tents belong to the porters who where caring supplies to the villages and to the base camp. I pitched my tent in a corner of a stone wall for protection from the wind while the porters gathered together and did what was seem like a stocktaking. I approached them and try to negotiate the price of some eggs, the price was ridicules and he wouldn’t go down, only then I realized that it’s so expensive because everything needs to be carried up here. Usually on the back of skinny, little Nepalese porters. At the beginning they looked at me in a weird way and couldn’t understand why I am not sleeping in the guesthouse like all the other trekkers, but after a while they got used to me. I am an enthusiastic Trekker, which means I like walking in nature with a big backpack that contains food, water, tent and cooking utensils. It often also means being in remote places, caring a heavy backpack in cold or hot climates, cooking dull food and sleeping on rocks or on an uneven surface. While some might consider this torture, I gain great pleasure from it. I guess that some people just can understand it but I will still try to explain. When I trek, I find myself submerge with the surrounding, it can be in the desert, forest, mountain or the shore. I blend into the environment and we become one. The plants, trees and animals are my housemates, and home is wherever I choose to pitch my tent. Very different from the city or driving in the countryside, where there is a barrier between nature and me. When I trek I enjoy observing. I constantly notice the weather, the shape of the clouds and how they move in the sky, I pay attention to the type of vegetation that is around me, not only for its aesthetics but also for the different uses it may provide, such as food, cordage or medicinal. Together with that, I keep my eyes and ears open for wildlife and their tracks. Walking with all the gear I need to be self sustain, gives me a sense of independence, security, achievement and most importantly, freedom. I can stop to cook wherever I want and whenever I feel hungry, there is simply no need to walk to the nearest restaurant or supermarket. Moreover, I can stay at one place for a few days or wake up every morning in a new one. In other words, I don’t have to walk until I get to a guesthouse/hotel or a hut, I can just pitch my tent when I feel I walked enough or maybe because I found the perfect spot to watch the sunrise. Yes, trekking can painful, and I feel that pain in many part of my body. The feet might get blisters, my legs muscles will ache, my shoulders will constantly transmit pain and the backpack will seem heavier with every minute that will pass. I look at this as a minor fee that I have to “pay” for having the beautiful and rewarding experience of trekking in nature.